THE TRAINER OF Jack Catterall, Jamie Moore, believes the courage of Ohara Davies was wrongly questioned in the wake of his sole professional defeat against Josh Taylor in July 2017. 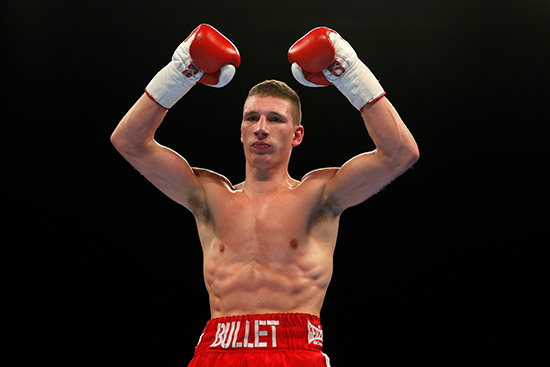 Moore’s punching pupil Catterall puts his own unbeaten record on the line against the heavy-handed Londoner at the Morningside Arena in Leicester on Saturday and the trainer has drummed into his charge to fully expect a fight to the finish. “When people call him a bottle job, I’ll be honest, I’ve watched that fight quite a few times now in the build up to this fight just to pick a few things up,” revealed Moore on the Glasgow encounter where Davies turned away after sustaining a broken nose in the seventh round. “One thing that stands out to me, watching the full fight over and over again, is he didn’t bottle it until the very, very last minute. “There were a lot of opportunities to do so in that fight from the third round right up until the end where he could have bailed out if he wanted to. He gritted his teeth, stuck in there and fought in the trenches. “The shot that broke his nose at the end was what did it for him and he sort of turned away. “He then got called a bottle job for turning his back on his opponent, bla, bla bla. I don’t see it that way, I really don’t. In a way that could be a reason why he digs his heels in a little bit more in this fight because he’s been given that label. Along with the rest of the fight fraternity, Moore is anticipating a cracker between Catterall and Davies in Leicester on a bill that also features a battle of the unbeatens between local lad Lyon Woodstock and Archie Sharp, as well as Sam Bowen fighting for the vacant WBO Intercontinental super featherweight title against Horacio Alfredo Cabral. 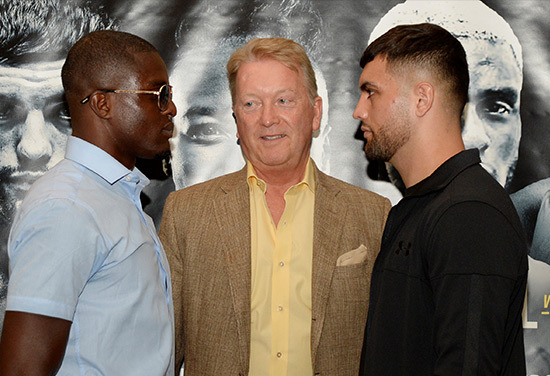 Nicola Adams fights for the Interim WBO world flyweight title against Isabel Millan and Daniel Dubois tests his heavyweight credentials against the vastly experienced Kevin Johnson. While Davies has overly indulged in hype and trash talk in the past, Moore is happy that both fighters have refrained from creating a sideshow in the build up to this one, which has all the ingredients of a thriller already. “Absolutely, you know what, I was at Carl Frampton’s press conference with Josh Warrington and you’ve got two of the best featherweights in the world, who were very respectful and both understand that it is going to be a hell of a tough fight, but they don’t need to bad mouth each other and don’t need to do that to sell the fight. “I think Ohara Davies has learned over time that it is not the be all and end all of selling a fight. Your actions speak louder than words. His last knockout (against Paul Kamanga), for instance, people took more notice of him for that one because he was a little bit quieter, a little bit more laid back. “He is learning and, I’ll be honest, I don’t think he is a nasty kid. I just think he’s been badly advised, he’s made a few wrong decisions and, you know what, in life who hasn’t made bad decisions in the past? THE TRAINER AND manager of Sam Bowen believes his man is undoubtedly the pick of the super featherweight litter. Carl Greaves has banged the drum for Bowen for some considerable time now, plugging his credentials across social media, while plotting a route for his charge towards British title success, which he achieved in April via an eighth round stoppage of Maxi Hughes. All this was done away from the glare of the TV spotlight, but that is about to change now Bowen has joined forces with Frank Warren and he will make his BT Sport debut on Saturday against Horacio Alfredo Cabral, with the vacant WBO Intercontinental title at stake. “I believe he is the best super featherweight in the country, bar none,” insisted Greaves, who has steered Bowen to 13-0. “I said it from day one, as soon as I saw the lad sparring top fighters and absolutely bashing them up, I knew I had a special fighter. “We’ve done it the hard way and come through. People were withdrawing from fighting him for a reason, they knew Sam from the amateurs and knew what he could do. Then we eventually got a crack at the British title after on 13 fights with no TV behind us and we went and stopped Maxi Hughes. “Sam, to be honest, never really got out of second gear and it was an easy night for him, with all due respect to Maxi. “I know I’ve got something very special and now with getting on the platform by signing with Frank Warren, I believe that Frank can take us all the way. “I’m surprised nobody picked Sam up earlier, to be honest, but we have now come to the table as British champion and there is really no building to be done. Bowen shouldn’t be short of gainful employment under his new regime, who also steer the careers of Zelfa Barrett, Lyon Woodstock and Archie Sharp. Greaves hopes there will be no more dodging the Bullet. “Obviously they are easier fights to make now and hopefully Frank won’t let anyone duck and hide away from Sam. Sam will fight anybody and he is the best of the bunch, but obviously time will tell. “They will be in for a shock because people don’t realise how strong Sam is until they are actually in with him.